Hello everybody! Am still in "Holi" mode! While part of me misses all the fun and revelry associated with this festival in India, another part says "come on, you get to celebrate multiple times, so what if its on a smaller scale"! The thing is, Holi fell on 27th March which was a working day. So hubby & kiddo went to work and school respectively. But then the little one had a half day and then we got to go for the Easter Egg Hunt along with a photo op with the Easter Bunny in our community. This was followed by a "mini" holi celebration of sorts with a few friends. Oh wait, there was also and accident involving a pointed pencil, an Easter egg and a rushed visit to the pediatrician to get a tiny hand bandaged (don't get me started on that! ), but that was forgotten in the over all excitement of the day! And tomorrow is another get together for some more color play followed by a potluck dinner - more masti, more magic! Generally I make these bigger, without food color. I also add some coconut and cashew nuts. But I was out of coconut and had no time to run a grocery errand. Also, couldn't add the nuts as my son is allergic to them and I had neither the time nor the patience to make two separate batches, one with and one without nuts, which is what I normally do. By all means, feel free to omit the food color and include the coconut and nuts, though to be honest, I did not really miss the coconut or the cashews! Preparation & Cooking: 20 minutes (excluding 30 minutes cooling) Makes: 30 approx. Roast semolina with ghee till it turns slightly golden brown and gives off a nice aroma. Boil sugar, water and saffron essence till the sugar dissolves completely then add in the cardamom powder. Gradually add in the semolina and the maida, stirring constantly till all the sugar syrup is absorbed, making sure there are no lumps. Switch off the flame, close and keep aside for about half an hour till the mixture is cooled and is relatively thicker and easier to shape into balls. 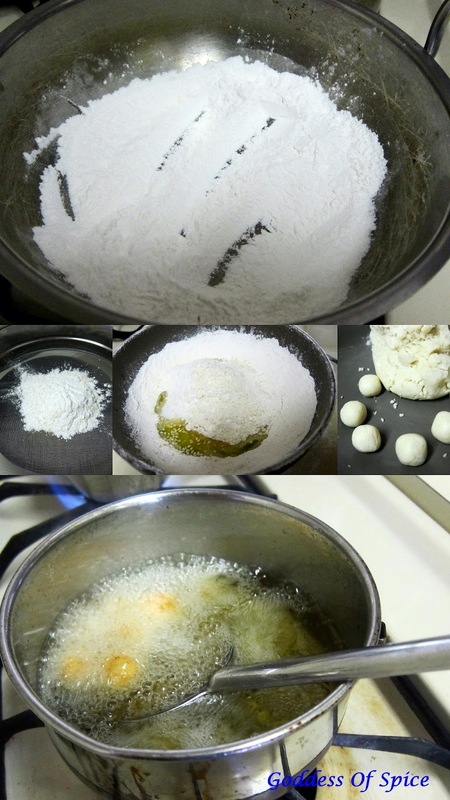 Separate the mixture into equal portions for the different colors, add a pinch of food color to each portion, knead and roll into smooth balls. Voila! Colorful laddoos for a colorful festival!! My birthday, a hectic week and a general sense of lethargy - all added up to my not visiting my blog for a whole week. 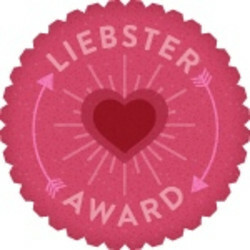 Imagine my surprise then when I came across this comment on on of my posts - "Hii,Happy to pass my Liebster award to you :)". Now, for someone who just started blogging for a lark, has no idea where she stands on this wide platform, not to forget, someone who hasn't won anything in her blogger avatar, the words "award" and " you" were enough to bring a wide smile to my face! So, Preeti Jaipal of "Kitchen Delicacies", I thank you from the bottom of my heart, for giving me the pleasure of winning my first ever recognition! Mention 11 random facts about yourself. Answer the 11 questions the tagger has set for you. Choose 11 new bloggers, having less than 200 followers, and pass on the award to them, linking them on your post. Leave a comment on their blog, telling them about the award. Frame 11 new questions for the bloggers you pass the award to. I am an avid reader - prefer fiction, but won't hesitate to read pretty much anything and everything I can lay my hands on! I have an enormous sweet tooth - just can't resist anything sweet! I love the fresh smell of wet mud after the first rains. Knitting and crocheting relax me. I love listening to music - language no bar, genre no bar. I have a shoe fetish - seriously! My closet is filled with slippers & shoes, some of which I haven't worn more than once or twice! I am a cleanliness freak. Infact my tendency to fuss about cleaning and my love for cooking have earned me the moniker "Monica" - you know Monica Geller from Friends! Regardless of whether I have a list or not, when I go shopping, I always go overboard! I am terrified of water - as in I have a fear of drowning. I don't watch TV regularly, but whenever I do, I do marathon shows - 3 hours of Bones or 4 hours of Top Chef or a whole day of Law & Order - you name it I have done it! 1. What’s the best thing you ever ate? I can't seem to pick one thing! Be it my mom's Vengaaya Sambaar with Potato Curry, or the Schezuan Ravioli at Confucius or the the steaming hot Idiappam & Stew eaten on a houseboat in Alleppey on my honeymoon - I love them all! 2. What is your favorite place for holidaying? 3. Do you watch TV shows? If so, which is your favorite? 4. What beauty product you cannot live without? I use my fair share of cosmetics, but something that I cannot live without - my moisturizer! 5. What you always aspired to be? Are your aspirations met? I read, knit/crochet and listen to music when I have leisure time on hand. 7. What is the most exciting thing you’ve ever done? The most exciting this I have done so far is river rafting. 8. Which is your favorite recipe from your blog? My favorite recipe on the blog is surprising not a sweet dish! It is the apple thokku! 9. What’s your favorite thing to have for dessert? I love rasagullas! Perfect dessert! 10. Your favorite shopping destination? No, its not Dubai or Honk Kong or New York - it is my good old Delhi! Specially in the company of my sister! 11. Sports or academics, your pick? Definitely academics - Much to the disappointment of my hubby, I do not possess a single athletic bone! If not a food blog, what? Where do you get your inspirations for cooking? Which chef influences your cooking the most? Who is your best critic? What would be the first thing on your bucket list? Name your favorite author or book? Which is your favorite place to hang out with friends? Which cuisine is your culinary strong point? It was one of those days when none of us were in a mood to eat a full fledged meal. All I got when I asked what do you want for dinner was "Make something light". My standard resort on such occasions is poha or sabudana khichdi or idli/dosa - you get the drif! Along the same lines, this time I made vegetable rava upma - a standard breakfast item at weddings and such along with the usual idli/vada/pongal! It was only very recently that I came to know that in Tamil Nadu, this dish is actually called "khichdi"! The discovery in itself was an amusing incident involving two of my friends - one from Madras (I still can't think of it as Chennai! ), the other from Orissa and ofcourse me! When the latter fed her kids "khichdi", the former was puzzled that it looked more like dal rice with vegetables and there was no sign of rava in it! After much confusion and some arguing, we realized that while two of us called the rice and lentils cooked with vegetables "khichdi" (I think that's what most of the country calls it!) the other one was looking for vegetable rava upma! As far as my husband and kid are concerned, when I say upma, it means vegetable rava upma. There is no way they are eating a plain upma! Also, one wants any and every vegetable, while the other is allergic to nuts and can't stand the sight of onions and capsicum in his. 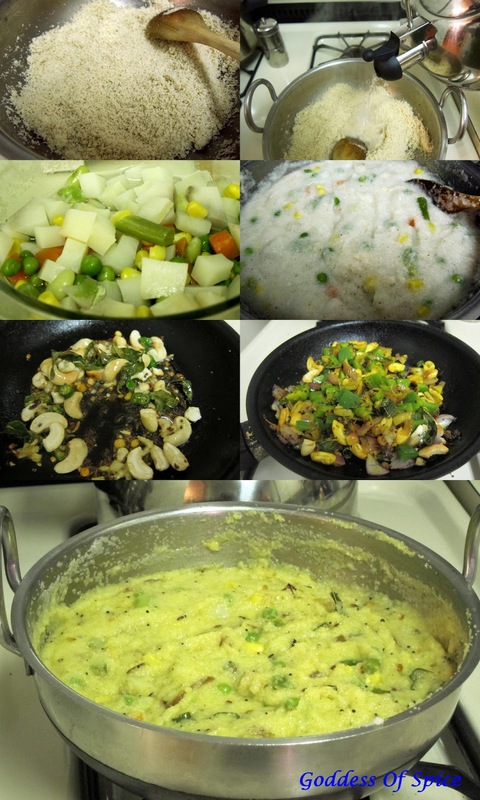 So, I end up making "customized" upma! What I mean is that, I cook my vegetables (I used the frozen mix of peas, carrots, beans and corn and added diced potatoes to it) separately in the microwave but saute the onions and capsicum along with the tempering in another pan! 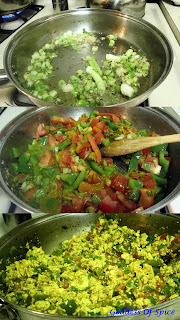 You can prepare the tempering and cook all the vegetables directly in the saucepan that you are using to make the upma. I just find it handy and quick to do all these things separately and since its the dishwasher that cleans the dishes, I don't hesitate to use an additional pot/pan! So, while the rava is being roasted, I boil water in the kettle, cook the veggies in the microwave and simultaneously prepare the tempering mix! Finally, I just add everything in parts, making sure to separate my son's share before adding the tempering. But by all means prepare the tempering, add in the rest of the vegetables, add water, bring it to a boil and mix in the roasted rava - all in the same vessel. Whichever way you choose to cook it, whatever you choose to serve it with (I did not go to the trouble of making chutney or sambaar, a Lime Ginger pickle was enough to satisfy us!) - this is a simple, fulfilling yet "light" meal! Microwave the vegetables for 5-7 minutes, till they are cooked. Bring about 3 cups of water to a boil in a kettle or another vessel - this hastens the cooking process as we don't have to wait for the bottle to boil when we add it to the rava. 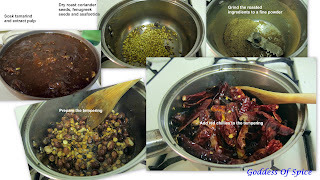 Heat the remaining ghee for tempering, add in mustard, jeera, urad dal and chana dal. When the mustard and cumin seeds splutter and the dals turn a golden brown, add in the curry leaves and cashews. When the cashews get a reddish tinge, add the onions. When the onions turn transluscent add the green chillies, ginger and capsicum and saute for a couple of minutes, then take off the flame. Roast the rava with 1 tablespoon of ghee till it turns a reddish tinge and gives off a nice aroma. Now, slowly pour in the hot water, stirring constantly so it doesn't form lumps. Continue to stir and cook till the rava reaches a smooth consistent texture and has absorbed most of the water. Now add the turmeric, salt, mixed vegetables and the prepared tempering. Mix everything well and cook for another minute. Serve hot with chutney/sambaar or plain old pickle - yummy! Whenever I order bubble tea, my son makes me filter out the tapioca pearls in there so he can eat them. He just loves them. I don't have easy access to those big tapioca pearls, so I thought why not buy the tiny ones and make some tapioca pudding for him. Now, all the pudding recipes I looked at had eggs in them, but I wanted to make an eggless version. Whenever I look for eggless cake recipes, people usually use condensed milk to make them. So, I decided to do the same for this pudding as well. I just adjusted the quantity of milk used accordingly and completely did away with sugar as I used sweetened condensed milk. As far as flavors go, I did add some cardamom powder as that is a standard spice used when making the similar Indian version of this pudding - Sabudana Kheer! I thought a little saffron would team up beautifully with the cardamom. But ofcourse I couldn't just stop myself there. I thought about what else I could add. All the standard pudding recipes had vanilla essence, so I added a bit of that as well. Then I remembered that I had some coconut pineapple ice cream in my freezer. Coconut would definitely blend in with all the other flavors and pineapple would add a nice touch - so thats it, I added a scoop of the ice cream as well! The end result was this gooey delicious mouthful of flavors that I simply loved! Well, the little one whom I actually made it for decided he did not want to eat it. "Amma, I want the big brown chewy pearls - not this!" was his explanation for not trying it! All I said was, his loss, my gain. Of course I'll be hunting a chinese grocery store close by to buy his "big brown chewy pearls" but I sure am glad I made this and will probably make it again as dessert when I have guests over next. The best thing about this was, I made it in the crockpot, so it did not require constant monitoring. I got done in about a couple of hours, the first hour of which was spent in getting my son back from school and running a couple of errands! Also, I did not soak the tapioca seeds before cooking, two hours in the crockpot got it perfectly cooked. Feel free to experiment with other spices and flavors, but if you want a hassle free dessert - this one fits the bill! In the crock pot combine tapioca seeds, milk and salt and cook on high for 1 hour. Add in the condensed milk, cardamom powder, saffron strands and vanilla essence and cook for another 45 minutes. Finally mix in the scoop of ice cream, cook for another 15 minutes and switch off the crockpot. How often, when asked about what we cooked for dinner, have we responded with -"Oh nothing, just some rasam"! Just think about it, even a simple dal gets a better mention when compared with this South Indian staple. What do we turn to when we are down with the sniffles, what do we resort to cooking when we are out of time and ideas, what do we make when we are thinking of home - as far as I am concerned, the answer to all these is Rasam. Today's recipe is the humble Rasam - Lemon Rasam. For the uninitiated, there are a zillion different varieties of rasam, not the standard one prepared in the restaurants. Ditto for sambaars. But that is for another day and another post. For now, let us stick to the lemon rasam. Infact, I prepare lemon rasam also in two different ways. One is from the recipe book "Dakshin". The other, the one that I am posting today, is the way my mom prepares it. Rasam is generally associated with a tamarind base, but for lemon rasam, you don't need any tamarind. The lemon provides the required tanginess. I have used homemade rasam powder - will soon be posting the recipe for the same. Feel free to use the store bought one thought. Serve rasam with rice and a curry on the side or drink it up hot and steaming as I do - yummy! Cook the dal in a pressure cooker with a pinch of turmeric and salt, till it is soft and mushy. Grind together the tomato, ginger and green chillies into a smooth puree. 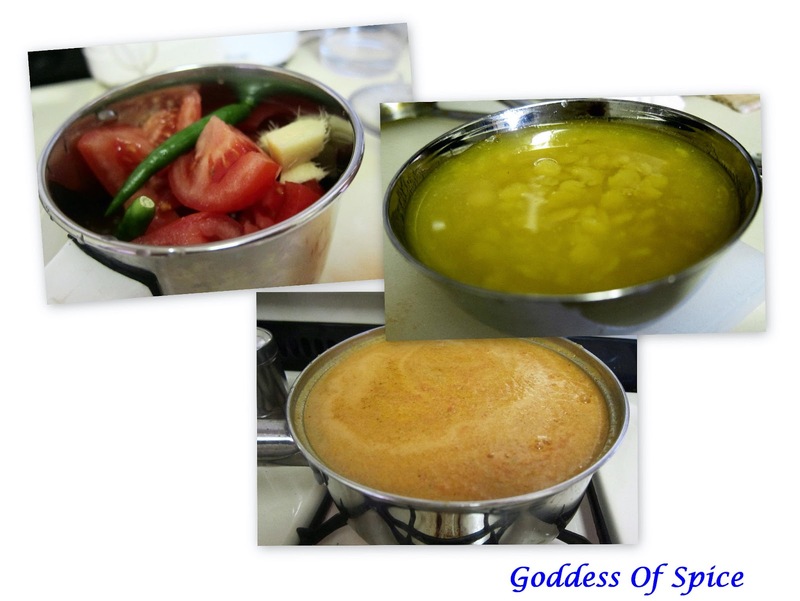 Combine the prepared puree, 4 cups of water, asafoetida, turmeric powder, rasam powder, curry leaves and salt in a sauce pan and bring it to a boil. Once the liquid begins to froth over, mash the cooked dal with the back of a ladle and add it to the rasam. Let it cook for another minute. Turn off the flame and add the the juice from one lemon. Serve hot with rice and side dish of choice. I am always breaking my head over what to pack for lunch for my little one. Doesn't matter that I try not to repeat the same thing very often, I still get the "amma, please give me something different" from him! I am sure most parents with school going kids would relate to this, or should I say most moms? Now I understand why my mom's daily bedtime lament used to be "naalaiku ennadi pack pannaradu lunchuku?" - meaning, what am I going to pack for your lunch tomorrow! Idlis, dosas, chapathis, pooris, rice based dishes, soups, pasta , sandwiches and even maggi - you name it and I have packed it! His favorite is stuffed paraatha, because he finds it easier to hold the paraatha rolled in a foil and eat while yapping away with his friends. But there are only so many varieties of stuffing that I can prepare at 5 in the morning! Anyways, I am always looking for ways to combine vegetables and some form of grain in an easy to handle compact form that would appeal to my fussy eater! While thinking along those lines, I hit upon this idea. Am sure its nothing unique and has been tried by someone or the other somewhere. But this is the first time I tried this, and it was a huge hit! I always keep crescent roll dough tubes stocked up in my refrigerator as they come in very handy - specially during the weekends when we have friends over for "chai-nashta". Now I thought, why not make pizza pockets with the same. But I wanted to add something more filling to it. My son loves pasta in various shapes and sizes - so I settled on orzo as the grain. He loves marinara sauce. While I have made sauces from scratch, it is just too much to ask of me if you are expecting me to make a small amount of the sauce everytime I make pasta for my kid! Though I am not a big fan of ready to use products, there are certain instances where I make an exception - pasta sauce is one of them - to be specific, store bought bottled marinara sauce; I am not too brand specific, though my current favorite is Giada's Vegetable Marinara sauce. I added a bit of this. Now, how could I leave out the veggies - so I went ahead and added some carrots, zucchini and broccoli as well. Feel free to add any vegetable you like - infact I even thought of using radishes but dropped the idea the last minute as I felt it would be too pungent and wouldn't blend in with the rest of the flavors. Forgot to remove them before clicking the final picture though :p!! Finally comes the cheese - come on, its a baked product for my kidddo - obviously am going to add cheese - loads of it! The end result was a surprisingly quick, delicious and filling meal that was easy to handle and well liked by my sweetie pie! After the way he asked "amma, can I have the same thing tomorrow?" - this one is a keeper! Cook the orzo till tender. Drain and keep aside. Saute the carrots and zucchini in olive oil till they soften. Then add in the broccoli, and marinara sauce. Give it a good stir. Now add in the orzo, salt and pepper. Mix well. Roll out the dough, keeping the rectangles intact. Smudge over the dotted edges of the triangles with your fingers so they smoothen out and don't break into triangles. Cut each rectangle into three smaller rectangles. Place a small amount of the vegetable orzo on each cut piece and top it with the cheeses. Serve hot. Or cool down completely, wrap in a foil and pack them up in the lunch box for the little ones to enjoy at school! Vardhini's Bake Fest # 16 guest hosted by Surabhi. I love the luxury of online shopping - my favorite site being Amazon.com! But it has certainly spoilt me to the extent that I find it extremely frustrating when I cannot simply order something with a mouse click! While going to the store, picking, touching, smelling, trying and bargaining has its own charms (come on, you have to agree with me, specially if you are an Indian like me :) ), there are times when all I want to do is log in, browse and buy - specially if there is a fast shipping option! The reason for my starting off on this point is, recently my friend spoke about her having tried quinoa puliodarai at her aunt's place and that set off a craving for it. But the main problem was, while I had all the necessary ingredients for making a pulikaachal, I did not have any quinoa on hand. Boy did I wish I could just order some online during the day and get it by evening - just on time for dinner! But alas, that was not to be, so I had to drive down to the local grocery store to get some. I know, I know, I could have just gone ahead and made it with rice, which is probably what any sensible person would do. But moi being moi - just had to go and buy the quinoa! That is what prompted me to make my pulikaachal in a crock-pot instead of going the traditional gas top way. So, while I ran my grocery errand, the pulikaachal was cooking away in the crock-pot and got ready just around the time I finished cooking the quinoa - perfect timing! 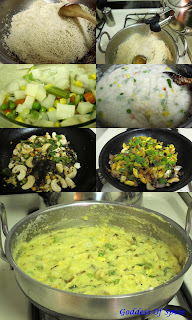 Now, I have used quinoa for making "curd rice" with tempering and pulao, even khichdi. But never for puliodarai. I loved it, will definitely be making it again. The spice level on this was through the roof - well we do have a high tolerance for heat, but if you prefer your food on the milder side, feel free to reduce the amount of red chillies used. The same goes for the tamarind - but this dish is an extremely tangy one. The pulikaachal prepared can be refrigerated and used whenever required. The ingredients mentioned below make pulikaachal to serve 6-8 people. But I added a few tablespoons of it to 1 cup of cooked quinoa which was sufficient for me and my husband and stored the rest for future use. Soak the tamarind in hot water for a few minutes. I usually microwave the water and tamarind for a minute then set aside for 5 minutes. Then prepare a thick tamarind pulpy juice by squishing the tamarind. With the said amount of tamarind, you should be able to extract 1½ to 2 cups of thick pulpy juice. Strain this and set aside. Dry roast the coriander seeds, asafoetida and fenugreek seeds and grind it to a smooth powder. Heat the sesame oil and all the ingredients for tempering. When the seeds crackle, add in the peanuts. When the peanuts turn a golden brown, add the red chillies and fry for a couple of minutes. Now, at this stage, if you want to continue cooking on the stove top, add in the remaining ingredients (except the ground powder) and cook, stirring slowly. When it starts boiling, reduce the flame and simmer till the raw tamarind smell disappears and the mixture thickens considerably into a paste like consistency. Finally add in the ground powder. Some people add in the ground powder just when mixing with the rice. But on the other hand, if you are out of patience and kitchen standing time, as I was, then go ahead and take out that additional gadget that's resting somewhere in you kitchen - yes I am talking about the crock-pot! Add all the ingredients (except the ground powder) to the crock - pot, set it at high for cooking, cover it with a lid and go ahead finish of your chores in the next couple of hours! Oh yes, one more thing - cook the quinoa as per the package instructions. I usually rinse it thoroughly and cook it in the microwave for about 6-8 minutes in double the quantity of water, stirring once or twice in between. Then I cover and let it rest for a couple of minutes and finally fluff it up with a fork. Some people say you should soak it, but so far I have not bothered to do that. Finally, mix in the ground powder, add the required quantity of pulikaachal to the quinoa and set aside for a few minutes before serving, that way the quinoa will absorb the flavors better. Usually for the amount of qinoa cooked 3-5 tablespoons should do the trick, depending on your taste buds. Add a little at a time and keep tasting till you get your desired taste. PS: If you have left overs, don't worry, puliodarai always taste's better the next day! Another Valentine's Day came and went by. During the initial years of marriage I used to be pretty excited about "celebrating" V-Day - treating it at par with birthdays and our anniversary. As the years passed, it was just another day, though my husband never failed to get me flowers and/or chocolates, and of course we ate out. Then the little one came along, and at school, it certainly is a grand occasion. So, now I get a personalized hand made card from him :). As do his teachers and classmates! Well, sticking to tradition, I gave myself a holiday from the kitchen as far as dinner preparations are concerned. But we ordered delivery as it was freezing outside and it felt like too much to get dressed to dine out, specially after DH returned home tired from office and DS was about ready to doze off! But I decided to make dessert at home. Made jelly for the little one, so was at liberty to try out something different for us. Last year, on my trip to India, my cousin made this delicious molten lava cake that I absolutely loved. Have been meaning to try it out for sometime now. So took this opportunity to do the same. I used the molten chocolate cake recipe from Martha Stewart's website, but modified it to suit what I had in mind! For one, I used a combination of Ghirardelli intense dark 86% chocolate and Hershey's bittersweet chocolate chips. Also, I served it with French Vanilla ice cream instead of whipped cream. A few years back, I used to watch Chef Curtis Stone's show Take Home Chef. In the show, chef Stone would visit a grocery store, randomly pick one of the customers, shop for them, go home with them and cook them a wonderful meal. Am sure that show has prompted me on many an occasion to pay attention to what I was wearing before I went grocery shopping! How many times have I wished Curtis Stone would film his show on the east coast! Imagine, a meal cooked by a celebrity chef - that he is way too cute in the looks department and speaks with that Aussie accent of his doesn't hurt either ;) Not any more though - now I am a regular in my "mommy" clothes, rushing along like a headless chicken trying to get all my chores done before rushing off to pick up kiddo from school and take him to whatever extra curricular activity is scheduled for the day! OK, my reason for going off at a tangent like this is that, in one episode of the above mentioned show, chef Curtis added a bit of chilli powder to his chocolate cake and the couple who tasted it were raving about it! Fast forward all these years, I decided to go ahead and do the same to my molten lava cake. After all, how many chances was I going to get to try something risky in desserts when I am not cooking for my son! OK, we have Martha Stewart and Curtis Stone. What about Priya? Oh I am there too - in a dash of Jamaican All Spice, a pinch of dry ginger powder and a few drops of Earl Grey tea! All the flavors worked pretty well, but the cake is REALLY REALLY intense! You definitely need the ice cream (preferably vanilla, so that the flavors don't clash) to enjoy this dessert. Another thing I'd like to mention is, bake the cake just before serving. If you leave it uneaten too long, it will deflate. Also, the inner molten layer will thicken. It just won't taste the way it is supposed to taste. The advantage with this recipe is, you can prepare everything, cover it with a cling wrap and refrigerate it, taking it out when you are ready to bake. Preheat the oven to 400 degrees Fahrenheit (200 degrees Celsius). Grease the baking cups with butter, dust with sugar and set them aside. 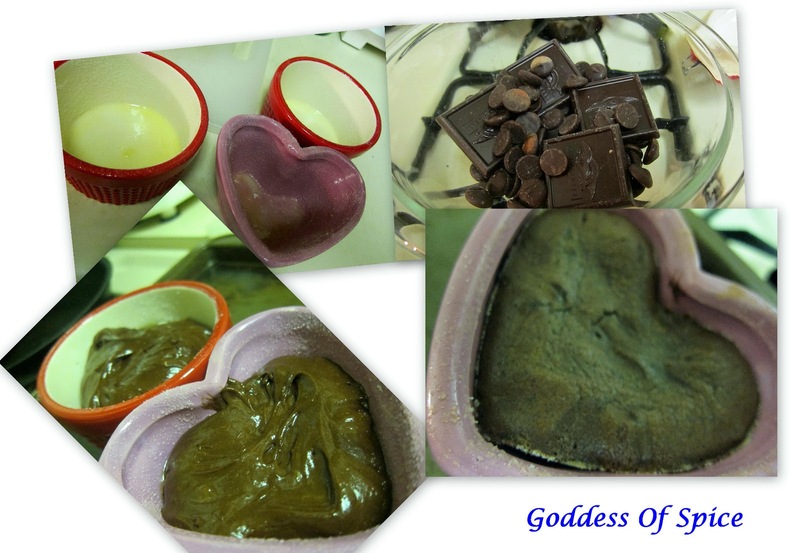 Melt the chocolate in a microwave safe bowl, stirring well after every minute. It will take around 2-3 minutes to melt smoothly, without any lumps. Add in the flour, salt and spices and mix till well blended. Dip 1 bag of Earl Grey tea in a glass of hot water, add a few drops of this to the mix as well. Finally, mix in the melted chocolate, divide batter among the baking cups and bake for around 10 minutes, till the tops of the cakes do not jiggle when shaken lightly. Remove from the oven, let it stand for 10 minutes. Turn out the cakes bottom side up, dust with confectioner's sugar and serve immediately with your favorite ice cream. PS: Don't forget to notice how the the inner chocolate layer simply oozes out when you make that first cut with your fork! I was too busy drooling over it, and by the time I finally managed to get around to clicking the picture, it was too late! So the picture does not do justice to the real thing! and the "Lets Cook/Bake For Valentine" event. Irene, Sandy and now Nemo! Hurricanes, floods, blizzards - you name it, we've seen it in the past couple of years! Very soon, we'll be pros at natural disasters - definitely not something I would have voluntarily asked for my list of achievements! As I am writing this the blizzard's going pretty strong! Well, whatever the name, I just hope everyone stays safe and mother nature decides we have been subjected to enough of her ire! Schools had an early closing today, so kiddo & I were safe home by 1 in the after noon, but DH reached home only after the drama started! He said the snow was stinging his face as he walked home from the station, what with the winds howling away! With all this talk of lousy weather, I had to make something take my mind off it. Well, since everyone was home comparatively early, decided to make something for the evening munchies. My kiddo insisted that he wanted only cookies, so I thought why not make something else for us adults. Amongst my earliest memories of this city that I call my home now is one of going out to NYC, just roaming the streets with my then new husband, in the blustery cold, munching on honey roasted nuts from the street vendors and absorbing the sights and sounds around me... I have often wondered if I could make those honey roasted nuts at home, but never tried it. Well, with this uneasy weather outside, I thought why not recreate the snack that reminds of something good that I enjoyed during the cold winters gone by. The little one is allergic to nuts, and since he wasn't in a mood for anything but his "jam bikkis and milk" for evening snack, I decided to try my hand at this slow cooker sweet and spicy nuts recipe that I had come across a while back while browsing the net. I forget what website it was or what exactly they used to make it - but do remember the use of cinnamon and cayenne pepper along with honey and maple syrup. I decided to tweak it to suit my taste. Sure is a keeper - not too much effort required, just dump everything in to the crock pot and stir every now and then! I used Kashmiri red chilli powder for that kick of spice and since I did not have any maple syrup on hand, I used some pancake syrup along with brown sugar. Now, for me, cinnamon always goes hand in hand with nutmeg and I also added a pinch of Jamaican All Spice. Grease the crockpot with cooking spray. Add all the ingredients to the crockpot, mix well so that all the nuts are coated evenly with the spices. Cover and cook on high for about an hour and a half, stirring every 15-20 minutes. Spread everything evenly on a parchment paper to cool down, about 20 minutes or so.